When you’re blogging for business, you may have no shortage of ideas on the topics you want to cover. But one of the first steps you must take — before hitting “publish” on your first blog post — is to identify your target audience. This can be more complicated than you might think. Most businesses have more than one type of reader or viewer they must target. And if you don’t have a strong idea of who your target audience is, you risk wasting a lot of time and energy on ineffective content. Too many business bloggers make the mistake of starting with content, hoping it will eventually attract an audience. The opposite approach is necessary. This article details how you can diagnose and more effectively reach your target audience when blogging for business. 1. 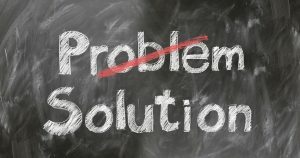 What problems do you solve? Every product or service that exists solves a problem, no matter how big or small. Law firms solve legal challenges for clients. Auto repair shops solve car problems for vehicle owners. Donut shops solve a problem for people craving fried dough. The list goes on. When you look at marketing from this perspective, you can break down your business to a basic level and simplify your search for your target audience. 2. Who benefits from what you do? Now that you know what problems you solve, think about the types of people who benefit from your solutions. Let’s go back to the auto repair shop example. This business would likely serve car owners in a specific geographical area, such as a neighborhood or a small town. Your experience serving actual customers will inform this process. Do your typical customers tend to fall within a certain age range? Do they tend to be middle class? Is a majority of your customer base women or men? Again, the auto repair shop in our example might serve an equal number of men and women who are 30 to 60 years of age and live within a 10-mile radius of Appleton, Wisconsin. Note that depending on your company and industry, you may have multiple types of people you’ll wish to target when blogging for business. And, different products and services may have very different customer profiles. Keep an open mind when thinking about your readers. 3. What is of interest to your audience? After you’ve established the members of your target audience, consider the issues and information that may be of interest to them. This will help you develop topics for your company’s blog well into the future. Our example auto repair shop might find its target audience members are interested in topics like vehicle maintenance tips, information on automotive recalls and how they can prepare their cars for winter driving. It’s helpful here to go back to step one and consider the problems your business solves. 4. How does your audience consume content? This may be the most difficult of all the questions to answer. It may require some extra legwork on your end to get it right, but it will be well worth it if your business blogging is to be successful. Content marketing is only getting more competitive, and businesses across nearly all industries must be engaged in some form of blogging if they are to compete for customers online. As you develop your brand’s blogging strategy, remember to keep your target audience top of mind at all times. It’s the only true way to achieve content marketing success.